When the Sun, the Moon and Jupiter, as they go about their preordained paths in the Universe, attain specific positions in relation to each other and the Earth, it is of immense significance in India. Each time this alignment happens in respect of one of four cities – Prayagraj, Ujjain, Trimbak-Nashik and Haridwar – it is believed that the water in the rivers that flow by them turns into amrit or holy nectar. Anyone taking a dip in it will have his sins washed away, and those of his ancestors too, thus achieving moksha from the cycle of birth and rebirth. This particular alignment of the celestial bodies happens at different intervals with respect to the four cities, and each time it does, crores of devout Hindus from all across the globe put their worldly pursuits on hold in order to purify and revitalise themselves at the designated city. When the Sun, the Moon and Jupiter, as they go about their preordained paths in the Universe, attain specific positions in relation to each other and the Earth, it is of immense significance in India. Each time this alignment happens in respect of one of four cities – Prayagraj, Ujjain, Trimbak-Nashik and Haridwar – it is believed that the water in the rivers that flow by them turns into amrit or holy nectar. Anyone taking a dip in it will have his sins washed away, and those of his ancestors too, thus achieving moksha from the cycle of birth and rebirth. This particular alignment of the celestial bodies happens at different intervals with respect to the four cities, and each time it does, crores of devout Hindus from all across the globe put their worldly pursuits on hold in order to purify and revitalise themselves at the designated city. In 2019, it is the turn of Prayagraj in Uttar Pradesh to host the world’s largest peaceful religious gathering, the Kumbh Mela, between January 15 and March 4.
he two groups. However, obviously, the asuras couldn’t be allowed to partake of the amrit. So when the kumbh containing the holy nectar emerged from the ocean, it was whisked away to the heavens. It is believed that in transit, four drops fell from the pot at the four cities. There are different types of Kumbh Melas – the Ardh Kumbh Mela, which happens once in six years; the Poorna Kumbh Mela, which takes place once in 12 years; and the Maha Kumbh Mela, which is celebrated only once in 144 years. Ardh Kumbh Melas are held in all four cities by rotation. The Poorna Kumbh Mela is celebrated only in Haridwar and Prayagraj, and the Maha Kumbh Mela always happens in Prayagraj. This spot is of utmost significance in Hinduism, because it stands at the confluence of the sacred Ganga, the Yamuna and the invisible Saraswati, and it is believed that it was central to Lord Brahma’s act of Creation. Recognising the significance and importance of this event, in December 2017 UNESCO put the Kumbh Mela on its Intangible Cultural Heritage of Humanity list. King Harshavardhana, who ruled northern India during the 7th century, and Adi Sankaracharya, the renowned 8th century philosopher, contributed to encouraging and popularising the Kumbh Melas. Chinese traveler Hsuan Tsang has mentioned the grandeur of the Kumbh Mela in his accounts of his sojourn in India. Prayagraj was till recently known as Allahabad. Haridwar is located on the banks of the Ganga, Ujjain on the river Shipra, and Nashik-Trimbak on the Godavari. The next Kumbh Mela is scheduled to be held at Haridwar in 2022. 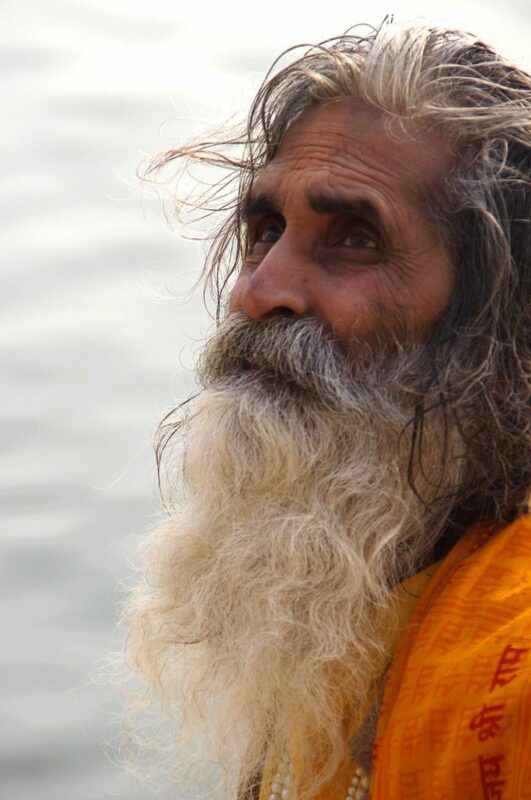 The Kumbh Mela draws sadhus and sages from across the land; hermits who have withdrawn from society to spend time in meditation emerge from isolation to participate in the Mela. Hundreds of thousands of ordinary men and women attend it too. This year, 120 million pilgrims are expected to attend the Prayagraj Kumbh Mela. Many devotees stay for the duration, undertaking an austere lifestyle to create the right mindset for absolute focus on the Divine. A significant contingent of international visitors from over 70 countries is also expected. Ambassadors of most of these countries had visited Prayagraj at the invitation of the state government for a preview of the arrangements for the smooth conduct of this mega event. The flags of the respective countries have been unfurled, and a good vantage point of Triveni Sangam, the meeting point of the three rivers, has been earmarked for VIP visitors. The Uttar Pradesh Government is going all out to ensure the comfort, health and safety of all pilgrims at this year’s event. A temporary city, called Kumbh Nagri, has come up over 32 hectares of land. It includes 250 km of roads, dozens of pontoon bridges, more than one lakh toilets, footpaths, police stations, fire brigade outposts, and comprehensive medical facilities. The whole area is lit up by 40,000 LED lights. Special campsites are being set up, including some with luxury tents for VIPs and international guests. The services of guides can be availed of. There is tight security in place. Prayagraj is well connected by railways to the rest of the country. The government has introduced the RailKumbh app to facilitate reservations to reach the Mela site. In addition, the national carrier Air India is operating special flights to Prayagraj from Delhi, Ahmedabad and Kolkata from January 13. 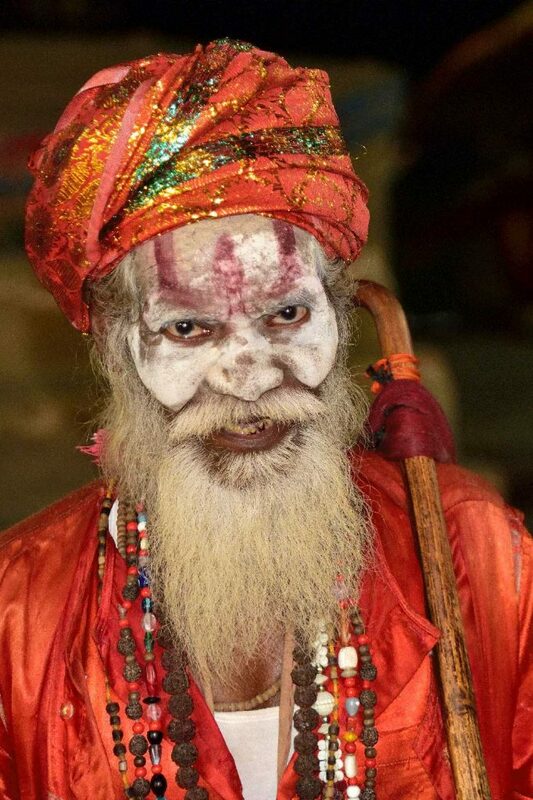 The pivot of the Kumbh Mela is the snaan or holy dip in the river. 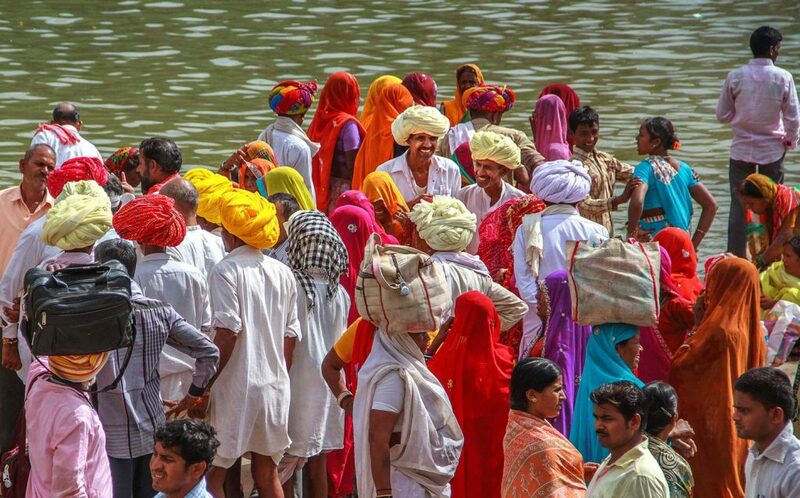 Although every day during the Mela is good for the dip, some days are considered more holy than others. These dates are announced ahead, and crowds swell exponentially on those days. 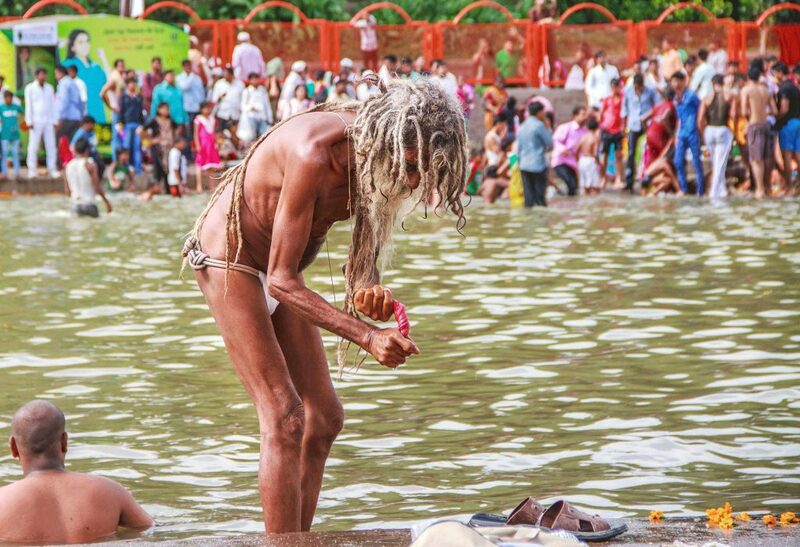 But the most important is the Shahi Snaan, or Royal Bath, which the sadhus take at the start of the Mela. The panoply of the different orders of holy men making their way in procession to the river is one of the highpoints of the Kumbh Mela. Another pivotal ceremony is the Aarati. Priests offer worship to the Ganga, Yamuna and Saraswati using lamps. The leaping flames of the devotional fires against the backdrop of dawn and dusk, accompanied by holy chants, make a compelling sight, and create an aura of utter piety. And for the duration of the Mela, the sages and holy men give discourses on religious topics. They share their knowledge and insights with each other, and the common man benefits hugely too, gaining a depth of understanding about the guiding principles of Hinduism. Through the rituals, the splendour, the piety and dissertations, there runs a subliminal thread – the concept of commonality, of oneness – aikya, of sangam or confluence. It is an affirmation of the union of all the cultures in the world, the interconnectedness of man and nature, and the common source of energy that powers all life.